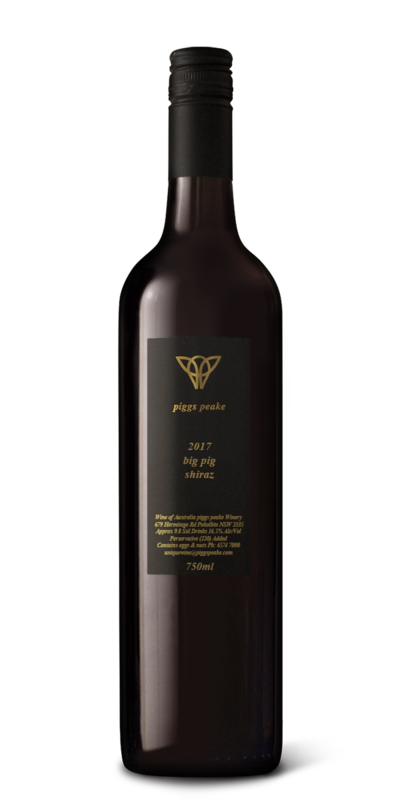 The Big Pig is a single vineyard wine from the Chalk Hill vineyard in McLaren Vale, S.A. The cool nights and maritime climate of McLaren Vale lends itself to a bigger, bolder style of Shiraz. 2016 was a colder year with a longer, more drawn out ripening period. The grapes were picked at about 15.5 Baume and cold soaked for five days in small (2.5 ton) open red fermenters. Then grapes were then warmed up and inoculated with a cultured strain of yeast and fermented hot as they were hand plunged 4 times a day. At 3 baume the grapes were pressed into new American Oak hogsheads where they finished fermentation. At the end of ferment the barrels were racked off gross lees and returned to oak and this process was repeated every 3 months up to bottling in March 2017. The resulting wine is very big and bold. The flavour spectrum is dark brooding fruits such as blackberry jam and mocha coffee characters from the oak. Surprisingly, my advice with this wine is to drink it in its youth while its still big and bold. Pick a cold night and a flavoursome beef dish.